After working out consistently (4-5 times per week) for over a year now, I've developed a post-workout routine which consists of eating a healthy snack that aids in the recovery process. I generally workout first thing in the morning, which for me is around 8:15 am until about 10:00 am. I don't eat breakfast before I workout, so I am hungry by the time I leave the gym but not hungry enough for a full meal. After reading this article, I've been following up most of my workouts with 10-15 minutes in my gym's sauna. After a grueling workout and sweat sesh in the sauna, I drink a lot of water which fills me up too much for a full meal, but a high protein snack always help to refuel me until lunch. I like to keep my post-workout snacks quick and easy. It needs to be something I can grab and eat or prepare quickly. Here are my favorite go-to snacks to re-fuel post workout. Potassium is one of the best recovery foods you can have, so a banana is an excellent post-workout choice. I like to jazz it up with a sprinkle of sea salt and cinnamon. Sounds weird, but trust me, it's delicious! Any kind of smoothie works here as long as it has nutrients that aid in the recovery process. I always add a protein powder since protein aids in recovery. This one is a favorite of mine. This is one of my favorite green smoothie recipes, but most of the time, I just wing it by adding a few of my favorite ingredients (orange juice, a banana, plain Greek yogurt, frozen fruit, and lots of spinach). What I love about Greek yogurt is that it provides a lot of protein in a small amount. You can get anywhere from 15-20 grams of protein in a small container of Greek yogurt. If you are weight training, Greek yogurt helps to repair the muscle tears that occur during strength training. I like to start with plain Greek yogurt and add fresh fruit and granola or a energy or trail mix to it. I was sent a package from Shoprite of products from its Wholesome Pantry line, which are all-natural, organic foods. I love this energy mix for eating on its own or adding it to yogurt for an extra boost. I keep a small container of it in my gym bag for munching on between workouts and yoga classes. Granola bars are probably one of the best portable snacks which makes them ideal to carry in your gym bag for after (or before) your workout. But not all granola and protein bars are created equal. Many have a lot of added salt and sugar and not enough fiber or protein, so be sure to check the ingredient labels. I love KIND bars. They are chock full of nuts and there's no added sugar. The dried fruits in the bars provide the sugar, which is plenty. Made Good granola bars are also a family favorite. They provide one full serving of vegetables and are organic and non-GMO. Pair your favorite granola bar with a piece of fresh fruit (an apple, mandarin, or banana are my favorites). I'm not a big fan of dried fruits, but I loved these dried Fuji apple slices from Shoprite's Wholesome Pantry line. They were the perfect combination of sweet and crunchy. The resealable bag makes it easy to throw them into my gym bag. On Fridays I usually run errands when I leave the gym. I like to bring a snack with me so I avoid the temptation of the fast food drive-thrus. 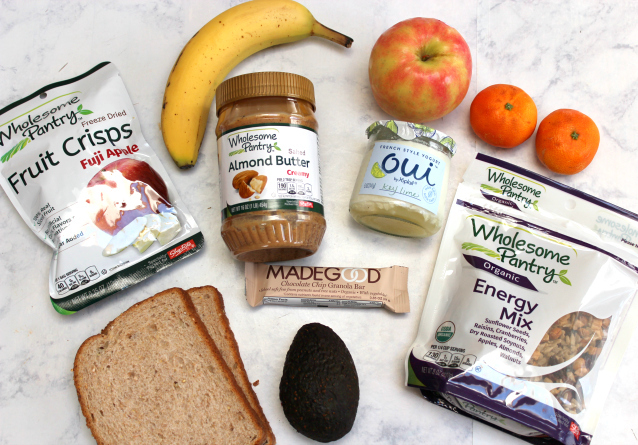 An almond butter sandwich is the perfect on-the-go snack. Make it high in fiber and protein with a fiber-rich bread (I like a 15-grain bread) and almond or cashew butter. Grab a handful of fresh fruit, and you've got a hearty post-workout snack. You can't beat the price point on the Wholesome Pantry almond butter. It's only $7 for a 16 fl. oz. jar. That's well below the price of other brands. Avocado toast is one of my all-time favorite foods. I love to order it out since every restaurant that has it on the menu makes it differently. Everyone puts a different twist on it, and when I make it at home, I like to try different toppings (radishes, goat cheese, scallions). Avocado toast is a great source of omega-3s and can aid in the recovery process. I'm a vegetarian. All of my snacks are meat-free, but you could add lean protein to the avocado toast or substitute it for any of these snacks. I also don't eat eggs, but hard boiled eggs are a fantastic post-workout snack.